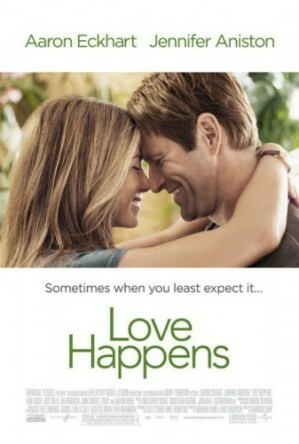 "Love Happens" is a sad, but interesting film. It stars actress, Jennifer Aniston, as a florist, who falls in love with a self-help author and motivational speaker, named "Burke Ryan" played by actor, Aaron Eckhart. Ryan is a widower, facing terrible pain, regarding his wife's untimely death in a car accident. He blames himself for his wife's death, but the reasons are not revealed until later in the film. In life, the self-help theme is a faulty one. True help and emotional healing comes from God through prayer. This movie contains profanity and other speech that is not suitable for family audiences. It's a shame, as it had a few decent messages on the grieving process and learning to let go of guilt.